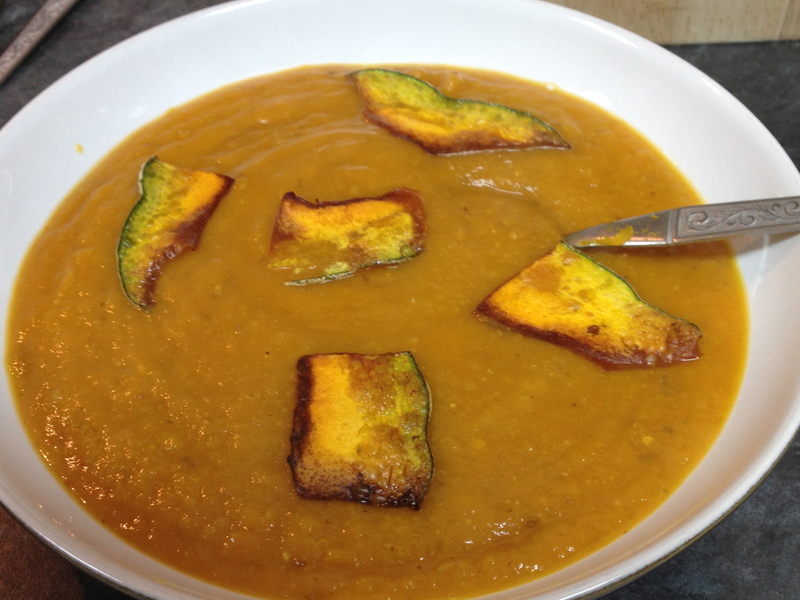 What better meal for halloween, than a roast pumpkin soup? It’s not that widely known that pumpkins come in 3 ‘types’ – those that are good for lanterns, those that are good for cooking and those which have great seeds. It’s a bit unfortunate that in this day and age there isn’t a multi-functional pumpkin available, but please bare this in mind when picking up your pumpkin on order to avoid disappointment! Yet again I’m using a ‘Crown Prince’ pumpkin – the same variety I used for my pumpkin pickles. It has the best flavour & texture. I roasted a 3kg pumpkin here but only used about 2/3rds of the flesh. Tomorrow I’ll be looking at something to do with the surplus. Pumpkins suit spices really well. You could use freshly grated ginger, sweet spices such as cinnamon and nutmeg or garam masala, or a simple curry powder. I’ve used a range of whole spices which bring an ‘anise’ flavour to the sweet squash – this works really well, along with some heat from a whole, dried cayenne chilli. I took the opportunity to use up some of my caraway seeds (to date, I’ve only been able to use these in Rye bread recipes. Note to self – must be more adventurous…) *If you don’t stock these, you could use fennel seeds instead.